This classic Dr. Seuss Beginner Book features silly tongue-twisters that will have listeners of all ages giggling with glee. With his unmistakable use of rhyme, Dr. Seuss creates a hysterical and energetic way for youngsters to discover the joy of words. If you could sum up Fox in Socks in three words, what would they be? What was one of the most memorable moments of Fox in Socks? All of them! Love David Hyde Pierce! I love Dr Sues book. They always make me giggle. I really hope my son does too. Too fast. No pictures makes it difficult to follow. Reader was not very good? Love the actual book but I think it needs to be read slower with more emphasis without the actual book. bought the audio version so my grandchildren could listen on the android tablet, and found out After that it wasnt available. Should at least be able to download the regular version without audio on my tablet since I paid more for audio than the reg book costs. As it is, I have nothing for this purchase. 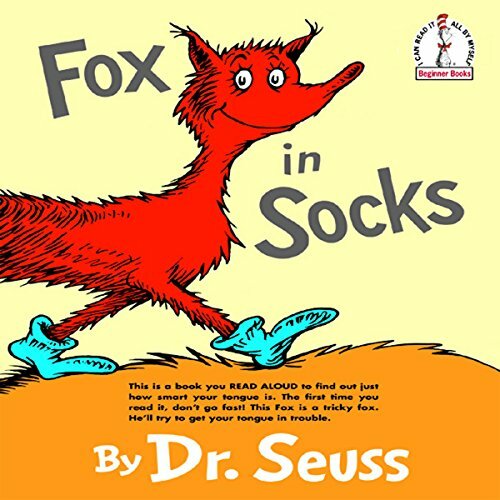 What other book might you compare Fox in Socks to and why? Who would you have cast as narrator instead of David Hyde Pierce? 0 sur 4 personne(s) ont trouvé cet avis utile. Maybe I missed something because I was redirected here from the Kindle sight... There was only audio to this book? What kid would like that? I need to go back a look closer to see if it said that on the product description. Feeling stupid and ripped off.